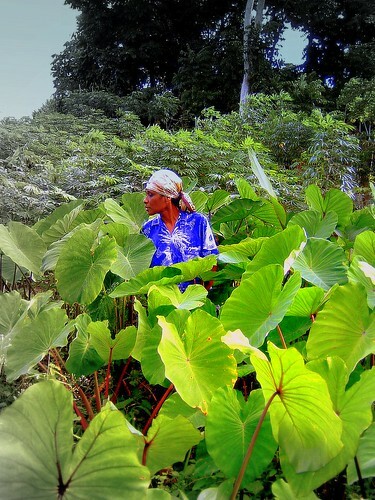 "At present, 96 taro cultivars are grown in the village. A survey carried out among 12 farmers growing 51 of the cultivars and complemented by a DNA diversity study, revealed that each named cultivar corresponded to a separate genotype. Six cultivars were described as ‘common’ as they represent 83% of all planted taros, whereas 40 cultivars were classified as ‘rare’ (8% of all planted taro). As each farmer plants an average of about 20 cultivars, he or she usually grows six common taro and 14 intermediary and rare ones." She then goes on to outline a strategy for the promotion of taro based on increasing farmer access to diversity, by both introducing and testing new varieties and assisting farmers in developing new varieties through crossing.